With less than two days to go before IFA 2012 kicks off in Berlin, companies are playing coy with hints and winks about products they plan to show off. Samsung is perhaps the worst offender, posting a vague video Sunday about the "evolution of technology," alluding to a flat, keyboarded device complete with a S-Pen stylus. 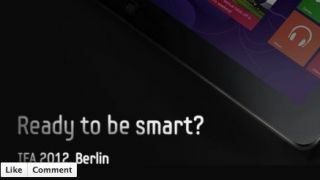 On Monday, the Samsung Notebook posted a shadowed Windows 8 tablet with the caption: "Ready to be smart? IFA 2012 Berlin" on its Facebook page. The video indicates the release of a tablet/laptop hybrid is imminent, though doesn't give details as to exactly when. Thanks to the Facebook post, we now have a pretty good idea. The Facebook photo reveals just a slip of a keyboard, though there's no sight of the stylus glimpsed in the video. Whomever who posted the photo wrote, "Don't worry, it's just around the corner…"
TechRadar has long anticipated a Samsung Windows 8 tablet, even getting our hands on a Developers Preview version in September 2011. Reports also indicate a Windows RT tablet by the South Korean company could debut in October, right around the time the Windows 8 OS becomes publicly available. Whatever Samsung has planned for inside or out of IFA's walls, TechRadar will keep you in the know.